Stewart is the world’s leading authority on ancient Greek sculpture and a prominent interpreter of many aspects of Greek art and culture. 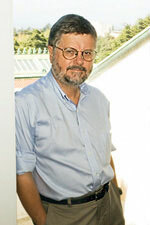 Stewart is the Nicholas C. Petris Professor of Greek Studies, History of Art and Classics at University of California-Berkeley and received the Distinguished Teaching Award for teaching excellence in 2009. He is also co-curator of Greek and Roman Antiquities at the Phoebe Apperson Hearst Museum of Anthropology at UC-Berkeley. He was a co-director of the excavations in Tel Dor, Israel, for many years. His talk is free and open to the public. A reception will follow his talk.